Feather destructive behaviour (FDB) has become quite common among companion parrots. The definition of FDB is any self-inflicted destruction of feathers. This may include pulling feathers out completely with the beak or feet, chewing them off at the body, barbering (snipping away small pieces), or shredding the barbules off of the central shaft. Frequently, solutions elude caregivers because there is not a full recognition of the complexity of the problem. 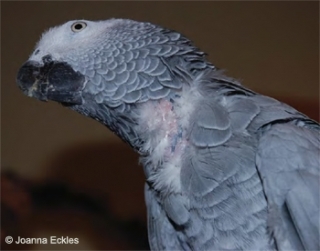 In her experience both as veterinary technician as well as behaviour consultant, Pamela Clark frequently encounters caregivers dealing with the frustration often associated with parrots exhibiting signs of feather destructive behaviour. She is here with us today to try and shed some light on the many causes of FDB, and provide guidance to the caregivers of companion parrots suffering from this affliction.